Sober Look: Why new CLO volume is declining? 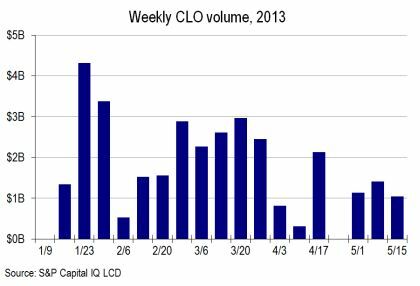 Why new CLO volume is declining? 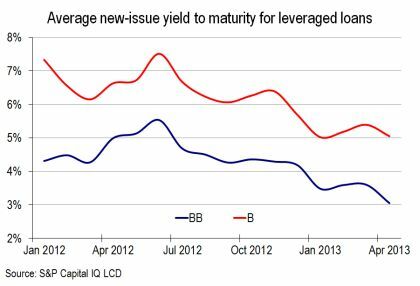 CLO issuance in the US got off to a strong start this year. According to LCD, issuance averaged $1.9 billion per week in January and February. The volume however has declined sharply since then. There are three key reasons for the decline. 1. Regulatory capital requirements for banks to hold AAA tranches is increasing (see this write-up for all the gory details). CLO managers tried to get their deals done prior to this change, pumping extra volume into the first couple months of the year. 2. There simply aren't enough corporate loans to build a diversified collateral pool quickly enough. We don't see enough LBO deals to generate sufficient amount of new loans - the much anticipated Dell transaction for example didn't take place. And most companies who wanted to refinance, already did. On the demand side, CLOs now face competition for loans from hedge funds, BDCs, and closed-end loan funds (see discussion). With few new loans for sale, a manager could end up with too much cash in the collateral portfolio. And you can't pay interest on liabilities with interest "earned" on cash. 3. Finally, the interest earned on the collateral - even if you can get it - is too low. As the table below shows, the latest CLO deal still pays LIBOR+112bp on its AAA tranche. It's a bit lower than the 120bp spread on some earlier deals (see discussion) but is still pricey relative to the declining spreads on the collateral (chart below). The income received on the collateral less the expense paid on the liabilities (all the tranches) does not leave enough net "juice" for the equity to generate worth while returns. And as long as that dynamic is in place, it's going to be increasingly difficult to print new CLO deals.